Edit: In fact, Mirko Bagaric has been proved prescient as the new (2011) government are in the process of abolishing home detention and suspended sentences. Some major pieces of legislation have passed through the Victorian parliament in the last couple of years. While the autumn sitting won't bring change on that same scale, the passage of a number of recent bills will affect the operation of the Magistrates' Court. The Magistrates' Court Amendment (Mental Health) Bill 2009 has been discussed here before. Other than being re-badged as the, 'Assessment and Referral Court' instead of the 'Mental Health Court' the trial list at Melbourne Magistrates' will go forward as discussed in that post. The Third Reading took place on 9th March. 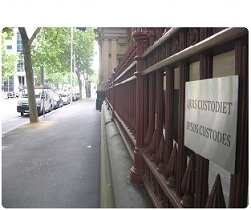 The Justice Legislation Amendment Bill 2010 - This is omnibus legislation the accomplishes several things, notably provisions that make breaches of Intensive Corrections Orders (ICOs) and Combined Custody and Treatment Orders (CCTOs) more like breaches of suspended sentences or undertakings (by way of application rather than charge). Other provisions of the Bill expand the scope of Home Detention Orders. It seems that Professor Mirko Bagaric was wrong in his confident prediction that the program would be abolished after its three-year pilot project expired. This Bill has not yet passed through Parliament. The Crimes Legislation Amendment Act 2009 was another omnibus bill. It increases the maximum penalties for the sexual penetration of children, amends the definition of document in the Evidence Act (Miscellaneous Provisions) Act 1958 (to make it consistent with the Evidence Act 2008) and extends the trial operation of Family Violence Safety Notices to December 2011. It received Royal Assent on 16 March.